Frogg Toggs may not be the most familiar name in fishing outerwear (yet), but this brand is growing its fan base, specifically on the performance-for-dollar value platform. The Pilot breathable guide jacket features a durable 4-ply nylon shell with Dripore C3 waterproof/breathable technology, and 100 percent waterproof, fully sealed seams. It has an adjustable storm hood and a fully covered zippered front with storm flap and rain gutter. Also included are adjustable neoprene wrist cuffs for a watertight seal. There is an expandable fly box pocket on the chest and “high-water” fleece lined handwarmer pockets, as well as laser cut waterproof tippet and fly pockets. 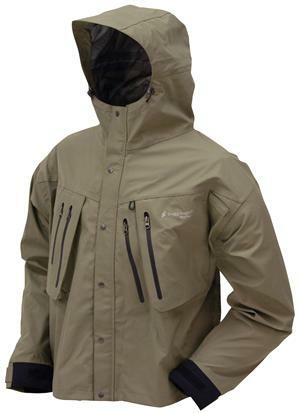 An adjustable shock cord waist band, a fold-away rod holder, and a full-cut swing back design, round out the features on this new jacket which is available in sizes S through XXL in Sand or Khaki colors. Available for $149.95 at a Frogg Toggs dealer near you. More mentions of Frogg Toggs on MidCurrent.